Badwater is the lowest elevation in the western hemisphere you can drive to. The actual lowest point, 282 feet below sea level is further out in the pan, several miles to the west. Dante's View is one mile away, straight up. The water has a definate odor to it. Brine flies, shrimp and several types of plants survive in this salty, alkaline environment. This geographic region--known as "Basin and Range"-- is spreading apart, fracturing the earth's crust along parallel faultlines. Huge blocks of land between the faults tilt like seesaws as the extention continues. You are standing above the dropping edge of a fault block that is rising on its other side to create the Panamint Mountains. Behind you, the steep face of of the Black Mountains is another rising fault block edge. These forces are still active. The next large earthquake could cause Badwater Basin to drop a few more feet below sea level. The oldest rocks - Relics of the Precambrian world in Death Valley The steep face of the Black Mountains is made up of some of the oldest rocks in Death Valley. These 1.7 billion-year-old Precambrian rocks are the remnants of an ancient volcanic mountain belt with flanking deposits of mud and sand. About 1.8-1.7 billion years ago, these volcanic and sedimentary rocks were severely metamorphosed—altered, recrystallized, and partially remelted by the Earth's internal heat and by the load of overlying younger rocks. The original rocks were transformed to contorted gneiss, making their original parentage almost unrecognizable. 1.7 billion-year-old metamorphic rocks. Quartz-feldspar gneiss dominates the mountain face above Badwater. 11 million years ago, these venerable rocks were injected with magma that solidified to form the Willow Spring pluton. The diorite to gabbro composition of the Willow Spring pluton blends well with the dark Precambrian gneiss, so you'll have to look carefully to see the contact between the two rock types. Beneath the dark shadows of the Black Mountains, a great, extraordinarily flat expanse of shimmering white spreads out before you. 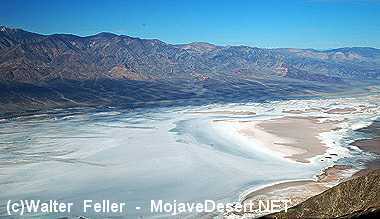 You are at Badwater, at -282 feet it is the lowest spot in the Western Hemisphere. Step onto the trail and you'll see that the white expanse is made up of billions of crystals of almost pure table salt! As your feet crunch along the trail that leads onto the valley floor, you are walking on the salty remnants of a much greener, lusher time in Death Valley's relatively recent past. Not long ago, during the Holocene (about 2000-4000 years ago), the climate was quite a bit wetter than today. So wet that streams running from nearby mountains gradually filled Death Valley to a depth of almost 30 feet. 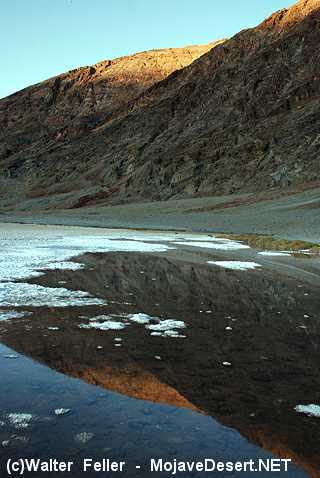 Some of the minerals left behind by earlier Death Valley lakes dissolved in the shallow water, creating a briny solution. The wet times didn't last. The climate warmed and rainfall declined. The lake began to dry up. Minerals dissolved in the lake became increasingly concentrated as water evaporated. Eventually, only a briny soup remained, forming salty pools on the lowest parts of Death Valley's floor. Salts (95% table salt - NaCl) began to crystallize, coating the surface with a thick crust about three to five feet thick. Here at Badwater, significant rainstorms flood the valley bottom periodically, covering the salt pan with a thin sheet of standing water. Each newly-formed lake doesn't last long though, because the 1.9 inch average rainfall is overwhelmed by a 150-inch annual evaporation rate. This, the nation's greatest evaporation potential, means that even a 12-foot-deep, 30 miles long lake would dry up in a single year! While flooded, some of the salt is dissolved, then is redeposited as clean, sparkling crystals when the water evaporates. Even as the basins and ranges form, erosion wears down the mountains. Debris from the surrounding area washes into this basin since it has no outlet to the sea. But erosion cannot keep up with the geologic forces that continue to create Death Valley-- the basin drops faster than it fills. After millions of floods, nearly 9,000 feet of sand, silt, gravel and salt fill the valley basin. At the top of the alluvial fan to the south, a series of gravel banks run parallel to the mountain face. The fault block, dropping during a massive earthquake, caused these fault scarps. At about 2,000 years old the scarps are recent evidence of the forces that have created, and continue to shape Death Valley. To have exposed land below sea level, an extremely dry climate is necessary. In wet climates, low places fill with water and overflow to the sea. A dry climate evaporates water, leaving behind salt flats or briny lakes. 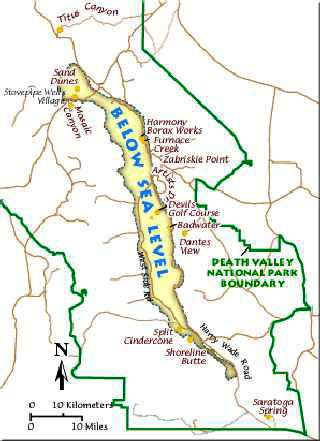 Like most of these locations, Death Valley was not created by a river's erosion. Movements in the earth's crust have dropped it to such great depths. The vast, surreal salt flats of Badwater Basin change constantly. Salt crystals expand, pushing the crust of salt into rough, chaotic forms. 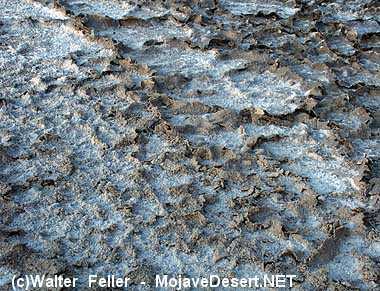 Newly formed crystals ooze between mudcracks, sketching strange patterns on the surface of the salt flat. Passing rainstorms wash off windblown dust and generate a fresh layer of blinding white salt. Floods create temporary lakes that dissolve salts back into solution, starting the process all over again. The source of Badwater's salts is Death Valley's drainage system of over 9,000 square miles--an area larger than New Hampshire. Rain fallling on distant peaks creates floods that rush ever lower. Along the way, minerals dissolve from rocks and join the flood. Here, at the lowest elevation, floods come to rest, forming temporary lakes. As the water evaporates, minerals concentrate until only the salts remain. After thousands of years, enough salts have washed in to produce layer upon layer of salt crust. Water is rare and precious in Death Valley. A surveyor could not get his mule to drink from the pool. He wrote on his map that the location had "bad water," and the name stuck. 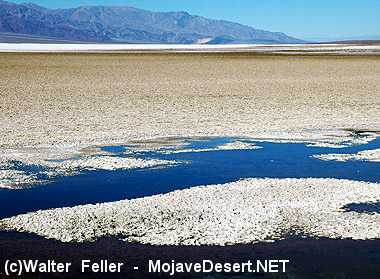 Badwater Pool is not poisonous just salty, as the presence of pickleweed, aquatic insects, and larvae proves. It is also home to one of Death Valley's rarest animals-- the Badwater Snail. These tiny mollusks exist only in a few springs at the edge of Death Valley salt flats. Ancient water fills this pool year-round. Much of it began as Ice Age snow and rain hundreds of miles away in the mountains of central Nevada. The run-off seeped into porous limestone bedrock and began a long underground flow through a regional aquifer. 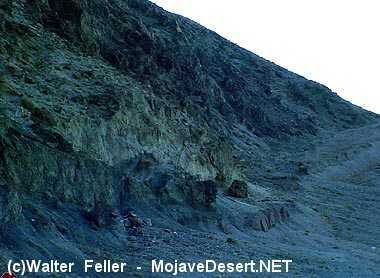 It emerges here at Badwater along the faultline at the mountain's base. Salts dissolve from old deposits and flow to the surface, making the spring water "bad." The steep face of the Black Mountains rises from the valley floor. 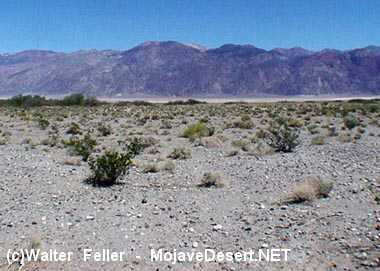 Few visitors realize that these mountains are made up of some of Death Valley's oldest rocks. At about 2,000 years old the scarps are recent evidence of the forces that have created, and continue to shape Death Valley. Salts dissolve from old deposits and flow to the surface, making the spring water "bad." After millions of floods, nearly 9,000 feet of sand, silt, gravel and salt fill the valley basin. Ancient water fills this pool year-round. Much of it began as Ice Age snow and rain hundreds of miles away in the mountains of central Nevada. 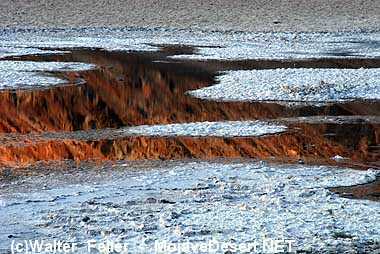 Death Valley was not created by a river's erosion. Movements in the earth's crust have dropped it to such great depths. 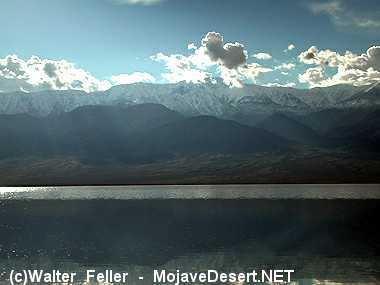 The Badwater salt plain as seen from Dante's View. The water evaporates until only the mineral salts remain.